Allyson Oken of the Atascadero News wrote a very nice piece about our troupe and the classes in the August 2014 issue of Morro Bay Life. Many thanks to Heather Salyer-Frith of Morro Bay Recreation and Parks for her kind words that were contributed to the article. 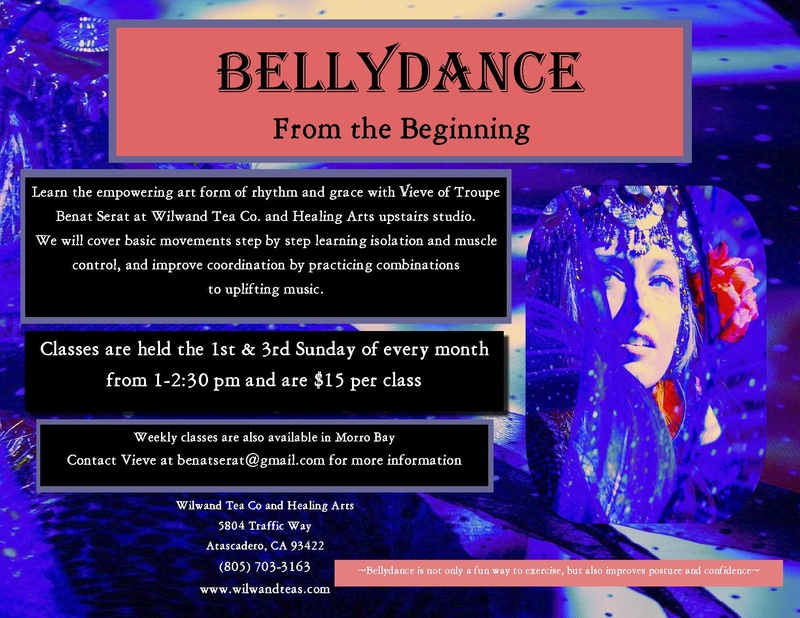 Learn the empowering art form of rhythm and grace with Vieve of bellydance troupe Benat Serat at Wilwand Tea Co. & Healing Arts upstairs studio in downtown Atascadero. We will cover basic movements step by step learning isolation and muscle control, and improve coordination by practicing combinations to uplifting music. Weekly classes are also available in Morro Bay. Troupe Benat Serat will be taking a break to enjoy some extra time with our families for the holiday season. 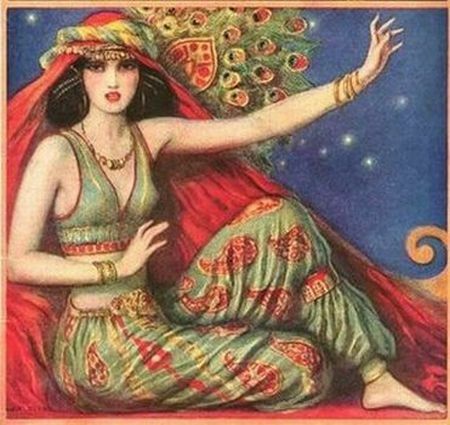 The weekly classes in Morro Bay will resume on Tuesday Jan 7th, and the next Bellydance From the Beginning class at Willwand Tea Co. will be on Sunday Jan 5th. We are wishing you lots of love and happiness and we’ll see you next year! 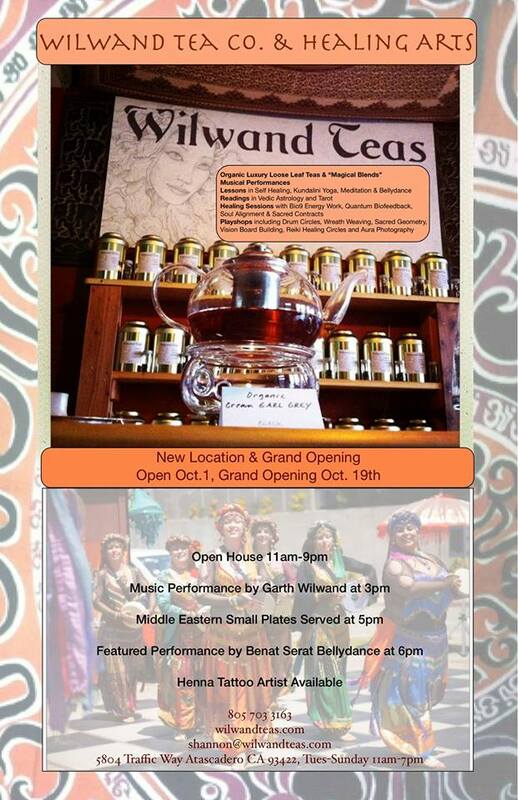 Troupe Benat Serat is happy to announce a special performance at the Wilwand Tea Co. & Healing Arts Grand Opening Celebration in Atascadero. The celebration will be from 11 am-9 pm on Saturday October 19, 2013. The community is invited to come by for tea and meet the tea bar and healing arts staff. The main events will be performances by singer, songwriter, pianist, Garth Wilwand performing at 3pm, followed by appetizers with a Middle Eastern theme at 5pm, and a performance by Benat Serat at 6pm. Inspired by our former director and choreographer Patti Harsch, Benat Serat is a belly dance group who has danced together throughout San Luis Obispo County since 1998 at farmer’s markets, festivals, and holiday functions. Troupe Benat Serat’s name means “a group of pretty girls.” The troupe is available for performances and community events. Patti Harsch has retired as of March 31, 2013.